“C’Est La Vie” is a well maintained and striking example of this popular Stevens 1240 DL model. 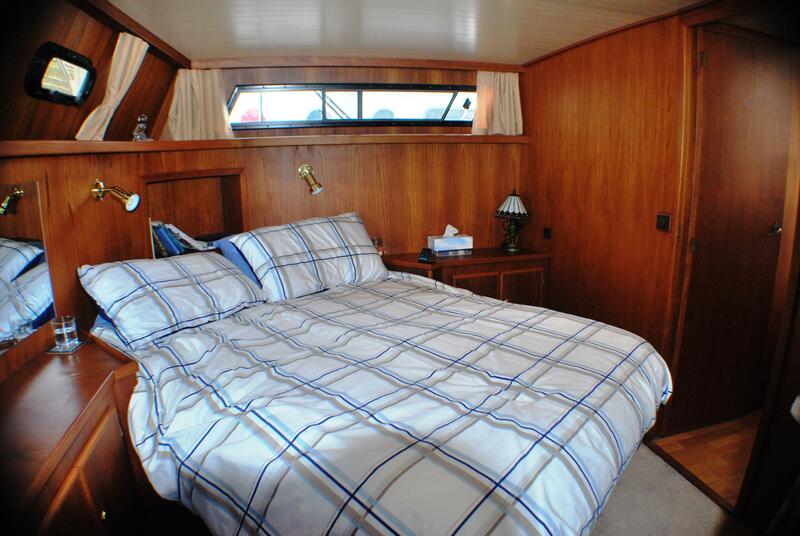 Her warm teak interior is both spacious and well laid out for long term live aboard cruising or short holiday breaks. 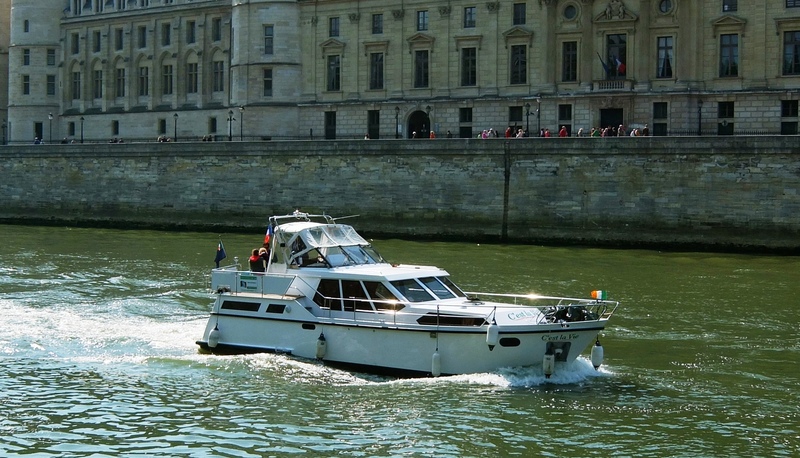 The boat has been sold to a Parisian couple who we know will take good care of it. Smelne (Stevens) Yachts are situated in the north of Holland and have been successfully building a range of quality steel motor cruisers since the early 1960s. Building approximately twenty five new boats per year, they have earned themselves a reputation for highest quality and good design. Nuala & I have taken this boat from Ireland to Dover, England by truck. From there we have motored the boat from Dover to Calais and onto Paris, Strasbourg before finally reaching Berlin. We then travelled from Berlin back up the Rhine to Koblenz, up the Moselle river through Luxembourg and onto Metz in France. From there we travelled down the canals in France to reach Chalon sur Saone where we are currently moored for the winter. 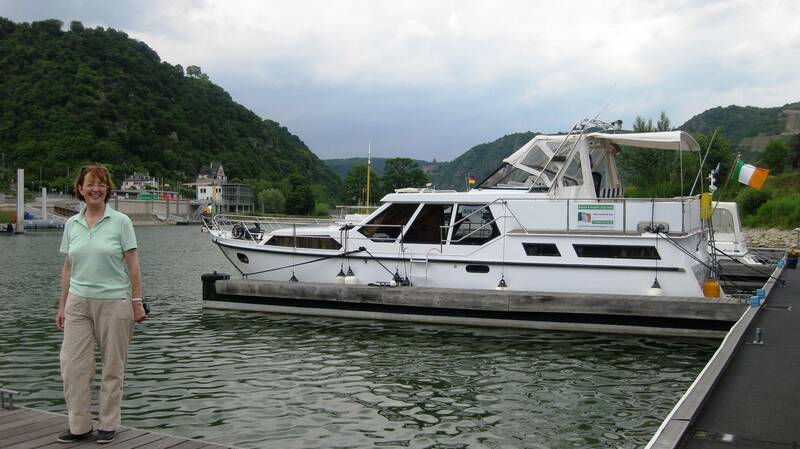 We have had a trouble free trip and the boat has easliy managed sea, canals, Seine, Rhine and Berlin Lakes. The boat was surveyed and overhauled by us in Ireland before we left. 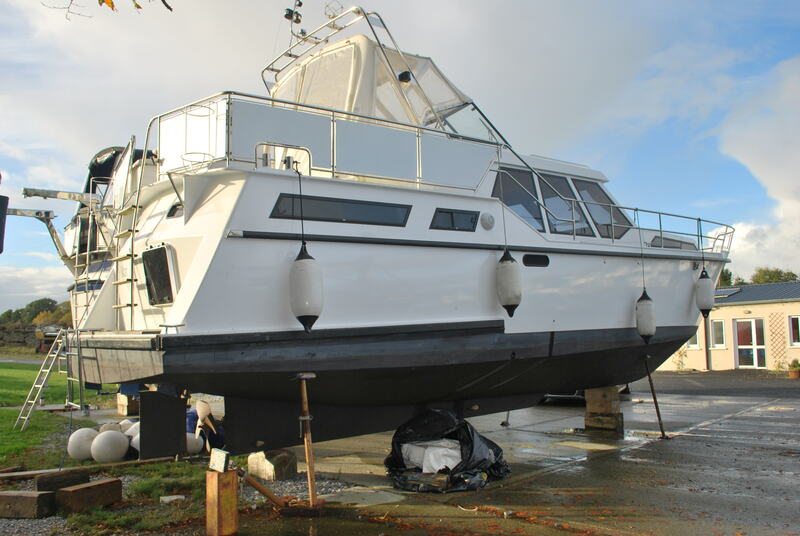 This included full engine service – varnishing of the teak decks- upgrading propeller- replacement of anodes- electrical survey- new inverter- new batteries. 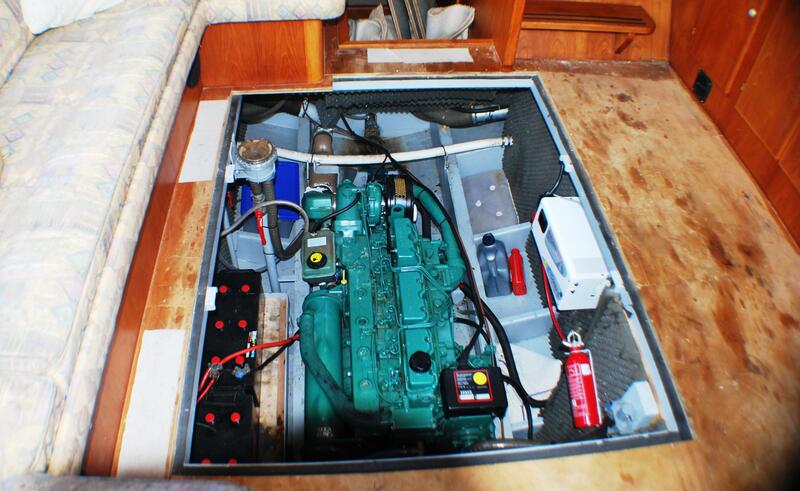 Very solid safe boat, fitted with a very reliable engine. Build quality superb with no short cuts taken. 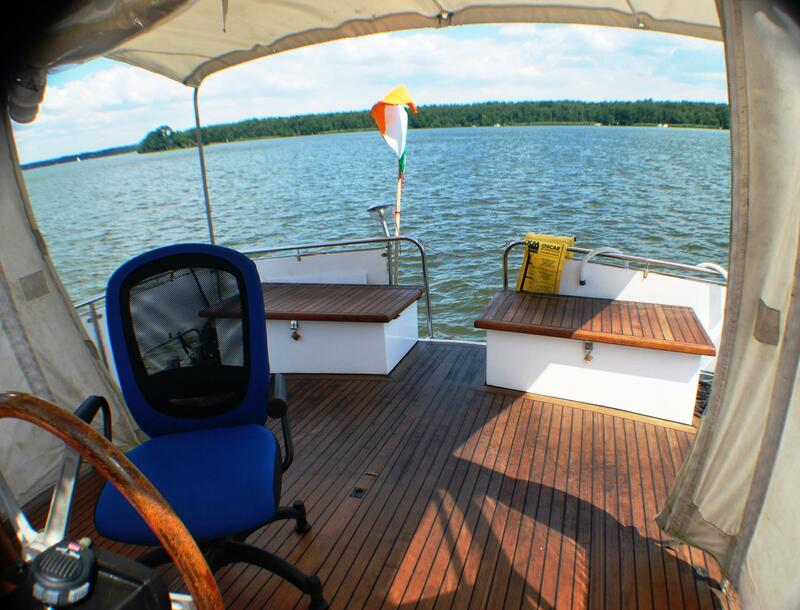 The boat will cruise econonically and comfortably at 12 kilometers per hour but has plenty of spare power when needed. Panoramic salon with large sofa seating, table. Kitchen with dinette. 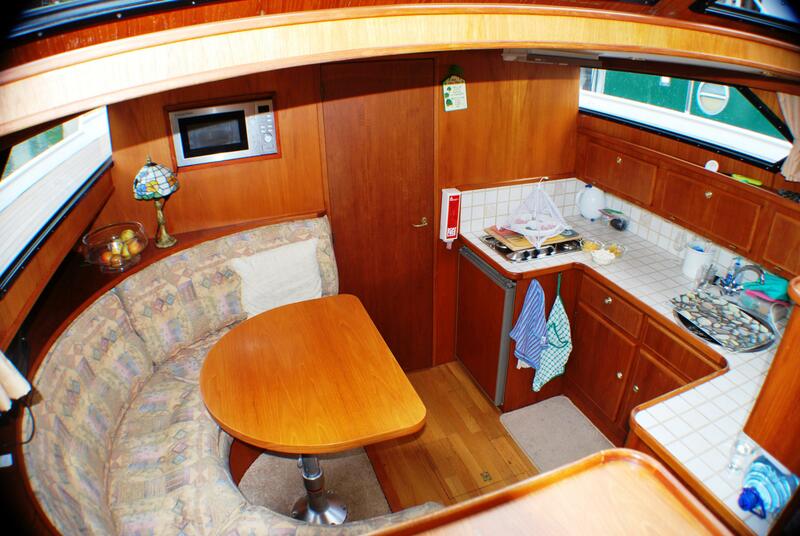 Forward cabin with V berth ( converts to double or office). 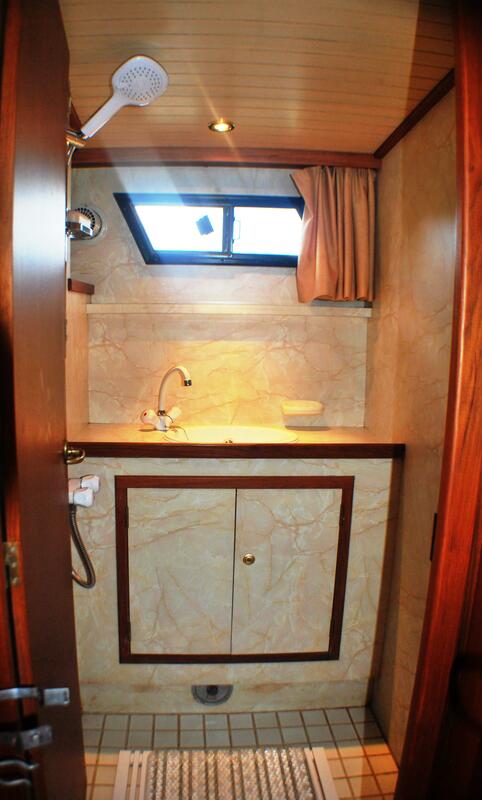 Spacious aft cabin with central double berth. Separate WC and shower. 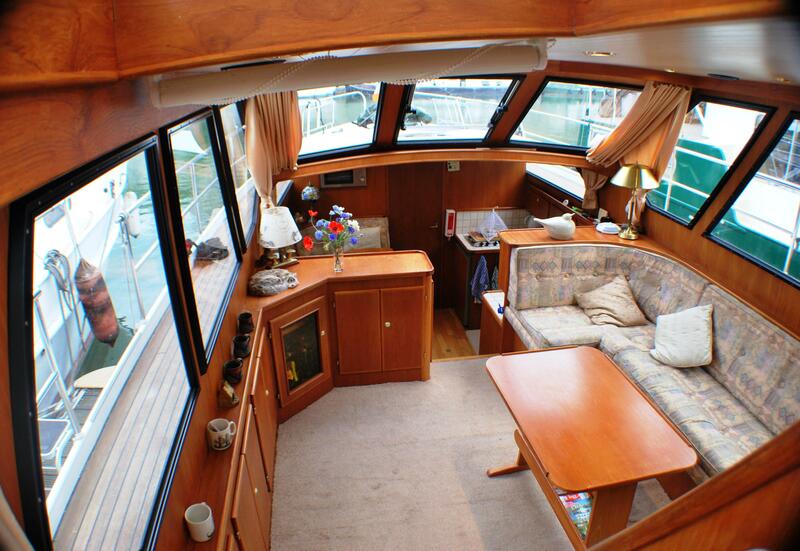 Large Aft Deck area for eating out or socialising. Wide walk ways make moving around boat easy and safe. By taking down radio arch ,canopy or windows the boat airdraft can be reduced from 4.3 meters down to at lowest 2.8 meters. Thus the boat will fit on all the canals in Europe. 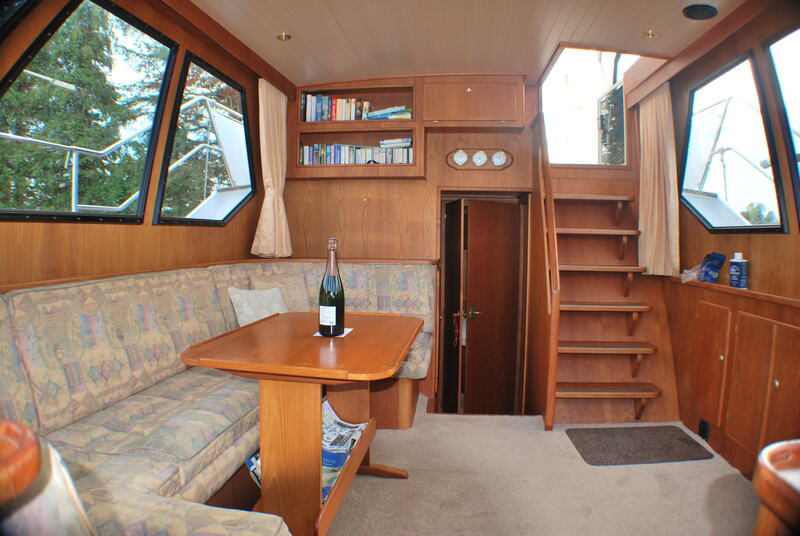 COMFORT Sleeps 4/5 people : One forward cabin with two single beds ( which can convert to double bed) and one aft cabin with walk around double bed. One Person can sleep on Saloon Sofa. 1 toilet and 1 shower. 2 x 95 Amp and 2 x 180Amp batteries (new) . All lights (except shower / bathroom lights) changed to LED lights Power consumption at 0.2 watts per hour is exceptionally low and boat can manage for up to six days without shore power. Thus we have found no need for a generator. Navigation Equipment : electric compas. speed guage. depth guage. 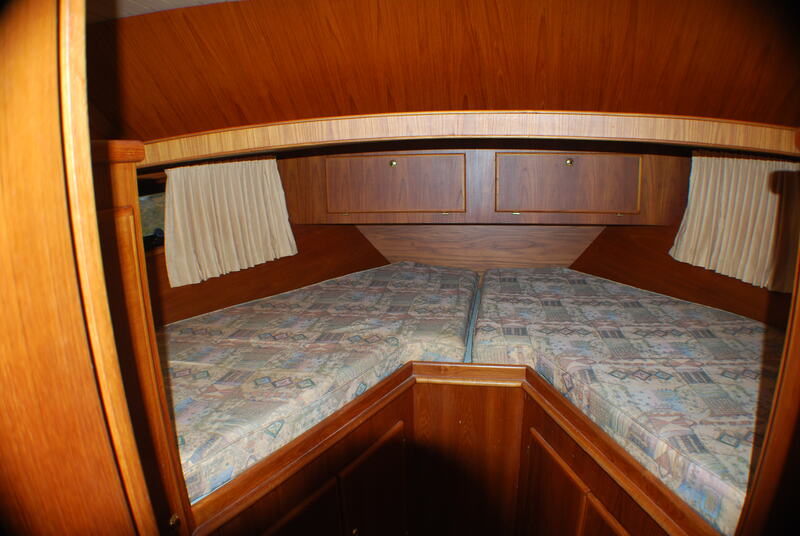 FORWARD CABIN – 2 x Single V Berths ( which converts to double bed). 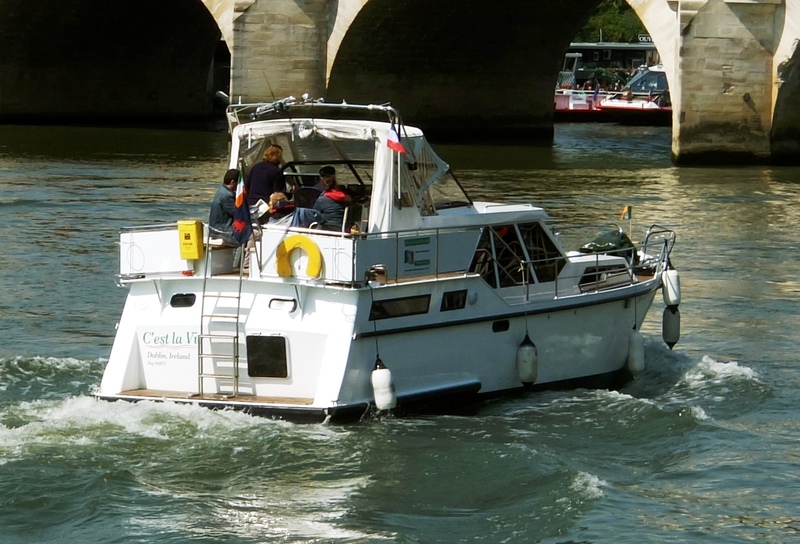 We are friends of Genevieve and Bills aboard River Pipit. They sent us your website. Thank you. You will have a wonderful year. We are shopping for our next canal boat arriving in Paris in October. 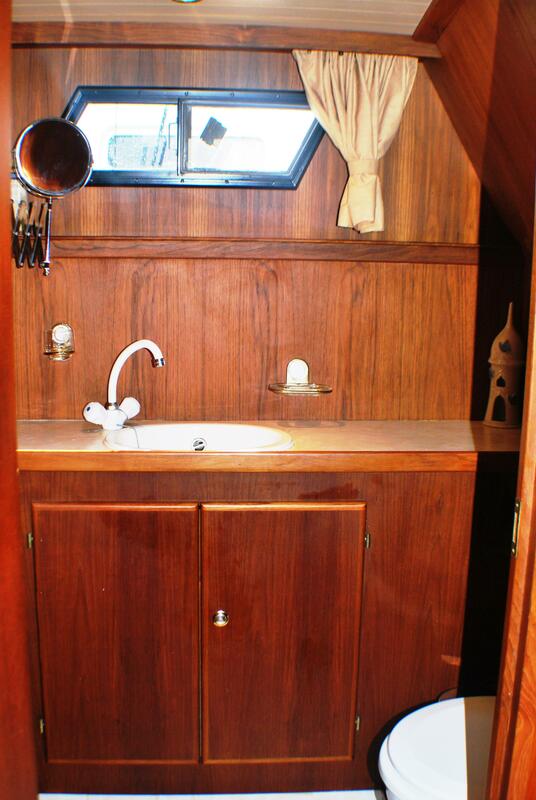 Does your boat have two heads and two showers? Bonne annee! Hi Our boat has one toilet and separate shower. We would have preferred initially ourselves to get a boat with two toilets and showers but this boat was so good we bought it. It amazing how easy you can manage and we have had up to 5 adults on board for over a week and it was fine.